» ECPA: Mug N Hug Lcpl Matt Hubner Warriors' Watch Riders: WE HAVE YOUR BACKS AT HOME! 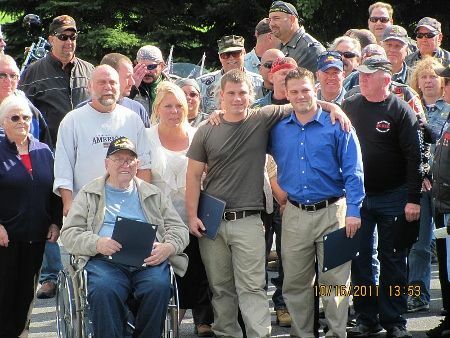 Two seperate chapters of the Warriors Watch Riders came together to Mug-n-Hug Lcpl Matt Hubner. The ECPA and SEPA met for the first of a 2fer on a beautiful, fall PA morning. We were unable to procure local fire and police support for our mission, so we made use of our experienced riders for road guarding and intersection control purposes. We surprised our hero as we roared and honked our way into his family’s neighborhood. Along with Matt, we were able to present honor coins to his brother Christopher (Irag Marine Vet), his dad Barry (Vietnam Army Vet) and his mom’s boyfriend’s dad Louis (Korean Navy Vet). Mrs. Tamale stepped in for A Heros Welcome and made the certificate presentations on their behalf. Thank you to the Hubners for inviting us to share in their celebration of their family’s veterans! Needless to say, we all enjoyed ourselves! No user commented in " ECPA: Mug N Hug Lcpl Matt Hubner "